We are of like minded people from Chennai. Recently we all would have come across an accident where a blind female student was hit by a vehicle while crossing road on her way to college and she died due to the fatal injury caused by it. Having read about it, we spoke to other female students of the same college and it was really heart-aching to know that most of them, do suffer while crossing roads, not only while going to college or schools, also while they are moving about, as they all don't carry the normal blind canes with them and this makes them an easy victim of such accidents. We wish to help all those blind young students especially females who move about for work and education and assure them with secure life by providing them with a Smart Cane, that comes with a sensor to detect the near approaching objects for the circumference of about 3 meters. We also came to know more about this cane, which is one of the most beautiful inventions by our Indian scientists and it is majorly sold in large number for foreign countries. This cane vibrates and signals the owner on detecting any nearing objects on their way. An individual can just keep it in hands and still it can vibrate on detecting objects. We made our initial talks with the manufacturer of this cane and came to know that this would greatly help our female sisters scattered around our city. We have started this noble vision of helping around 2000 blind students in and around Chennai, by providing this special cane as a small initial step. This is our small initial step, where we are planning to distribute the Canes bought by collected funds through one of the reputed NGO Udhavum Ullangal run by Mr. Sankar Mahadevan. We are going to distribute the canes throughout Tamil Nadu by reaching all districts one by one through our NGO. The Smart canes are little costly around Rs. 3700 per cane and it requires huge funds and support to attain this great feat. We are seeking through all means of support to gather enough money and sponsor for around 2000 smart canes. Providing the smart canes to these students will largely reduce such accidents and assure them security as well. Please support us by rendering your monetary help and we could make a great change in the society. This great product by our own country people should reach the hands of the needy. Let us also assure our fellow humans with good secure life just as we are enjoying. 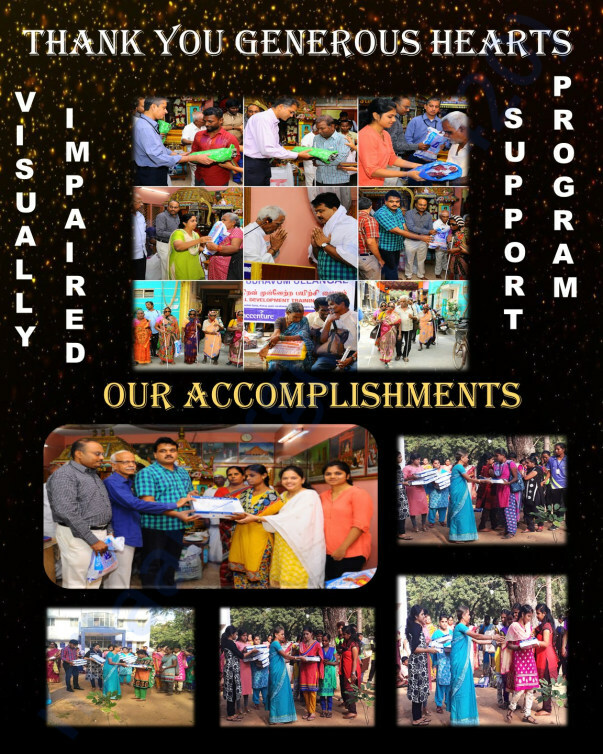 We conducted the Kickstart event of Visually Impaired Support Program with the help of Vallalar Trust Nesapakkam through Udhavum Ullangal NGO led by none other Sankar Mahadevan on 29th January 2018. As a part of this kick-start program, we distributed clothes, blankets, blind canes and daily utility kits to around 200 visually challenged individuals along with 10 Smart canes distribution for the college students of Queen Mary's College. The event was of grand success though it demanded huge funds which were spent by the NGO and Trust and many helping hearts who helped us at the time of needy. We would like to withdraw funds collected through this campaign to pay the pending amount and also to plan our upcoming events in future. Thanks in advance to all our donors who generously supported us. We are overwhelmed with your warm support. It is time to thank everyone who made their presence on 29th January 2018 for our program at Vallalar Charitable Trust Nesapakkam. With all our volunteers support we were able to donate white canes, clothes and blanket for around 200 visually challenged people in Chennai. Also we have kick started our objective of donating 2000 smart canes for female visually challenged college students. We have initiated our noble vision by donating smart canes to 10 visually challenged students of Queen Mary's Colleges, post which trainings were held to make them understand the usage of the smart cane. Words would not suffice to thank each and everyone who helped us achieve this feet. Special thanks to Anandhi for your contribution, which will soon reach the hands of the needy.